Any product that comes into contact with a vehicle’s paint should obviously be as soft as possible. Many types of disposable towels, such as paper towels, are made from wood pulp and the fibers are much more rigid and can easily scratch and leave swirl marks in the paint finish. Only materials with pliant fibers and lots of nap should be used for car washing. Nap is the product of many fibers that stick out, or are unwoven, from the material. Nap is what gives a material the characteristic of “softness”. Materials with more nap have the ability to pull dirt and grit up into the material and trap it away from the surface that is in contact with the paint. The more nap a product has the softer it feels and the more effective it will be at removing dirt and grit from the surface and protecting the finish. The amount of soapy water the material holds is also an important factor in choosing a car washing product. 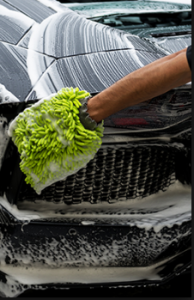 Soapy water provides an additional buffer between the sponge, mitt or cloth and the car’s finish. The soapy water will also help breakdown and loosen dirt and grit from the surface and make it easier for the product to then remove it and pull it into the fibers. The best car was products are also those that release any trapped dirt and grit trapped in the fibers into the rinse water so that they themselves do not become saturated. The ability of a material to release dirt into the rinse water will prevent it from becoming abrasive over the course of the wash process. The greater the ability of the material to release dirt and grit into the rinse water, the cleaner the product will be when it is reapplied to the vehicle’s finish, and the less chance there will be to damage the paint. Although chamois’ have traditionally been used to dry cars, based on the above criteria, they can also be used for the wash process. They are soft, have lots of nap, hold 5-6 times their own weight in soapy water, and release dirt and grit very well. However, because they can become discolored when used in the wash process, it is a good practice to have a separate chamois for use in the drying process. It is much easier to see any dirt and grit in the chamois that might be left on the vehicle with a non-discolored chamois. This will help to quickly identify when the wash process needs to be repeated. There are several types of material that are commonly used for wash mitts and each has its own characteristics. Cotton mitts have been available for many years and are comparatively inexpensive. They are reasonably soft, have some nap, and hold soapy water. However, they do not release dirt and grit as well as some of the other common materials. Microfiber mitts are a more recent development and have several advantages over cotton mitts. Microfiber is typically softer and has more nap per square inch than cotton. And because of the amount of nap, microfiber is exceptional at pulling dirt and grit away from the surface and trapping it in the material. It also holds more water and soap than traditional cotton weaves. 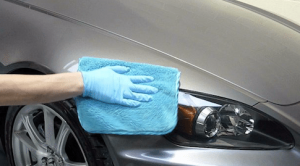 But microfiber does not release trapped dirt and grit well, and as a result a microfiber mitt can become saturated over the course of the wash process. Laundering in a washing machine will restore a microfiber mitt, but that isn’t practical in the middle of washing a particularly dirty vehicle. One of the most common and inexpensive types of sponges is the Grout Sponge. These types of sponges are available from auto parts stores, big box chains and home improvement stores. They are not particularly soft and because they are synthetic and cut to shape, they don’t have any nap other than the small degree provided by the holes from the air bubbles that formed in the manufacture process. However, the comparatively greater percentage of flat surface area (without nap) can trap dirt and grit between the surface of the sponge and the paint and cause scratches and swirl marks. Like all sponges, they do hold lots of soapy water and release the small amount of dirt and grit they are able to pick up into the rinse water well. Microfiber-wrapped sponges are much softer than regular sponges and, because they have a sponge at the core, hold lots of soapy water. The additional nap provided by the microfiber material wrapped around the outside is great at pulling particles away from the surface and trapping it in the material. But, like all microfiber, they do not release that dirt and grit into the rinse water as well as some other products. Chamois-Wrapped Sponges provide an alternative that retains all of the good properties of microfiber-wrapped sponges, but in additional to those will also release dirt and grit into the rinse water much more effectively. Natural Sea Sponges are not as widely available and can cost slightly more than some of the other products, but are often used by professional detailers on high-end vehicles such as Ferrari’s, Lamborghini’s, and Porsche’s, because of their excellent characteristics as a car washing product. They are highly recommended by the car wrapping Denver specialists. Although there are many types of natural sea sponges, the best type for car washing applications is the Sea Wool sponge. Sea Wool sponges are extremely soft and have an abundance of naturally occurring nap. They hold more soapy water than most other products and release dirt and grit better than any other material available. In addition, unlike synthetic sponges and microfiber, which are petroleum-based products, natural sea sponges are a renewable resource.